For the full skinny, check out David's hands-on for the phone. He's spent the better part of the last week playing with it. Although he found it suffered the usual "not-so-little" LG issues, the overall impression sounds much more positive compared to the last three times the V30 was released, especially when it comes to the display — a sore point on the previous models. LG also went with a triple camera setup, which is probably a smart move. When debating between wide-angle and telephoto, there's always a reviewer somewhere that will complain when an OEM elects for one over the other. By including both together with the primary camera, everyone can be satisfied. There's even a snazzy triple-photo feature that (slowly) takes a photo from all three cameras for you to choose from later. Apart from the display and camera, general specs are pretty similar to the V35S ThinQ, though you'll have to wait for our full review to know how its differences stack up. So far, there isn't any availability or pricing for unlocked sales of the LG V40, so you'll have to snag one through a carrier or not at all — at least, for the time being. Thankfully, we do have the details for all the major US players. Verizon customers get a bit of a head start when it comes to pre-orders on October 11th. Pricing is $40.83 a month over 24 months or $979.99. General availability, again, is a day earlier than everyone else, on October 18th. 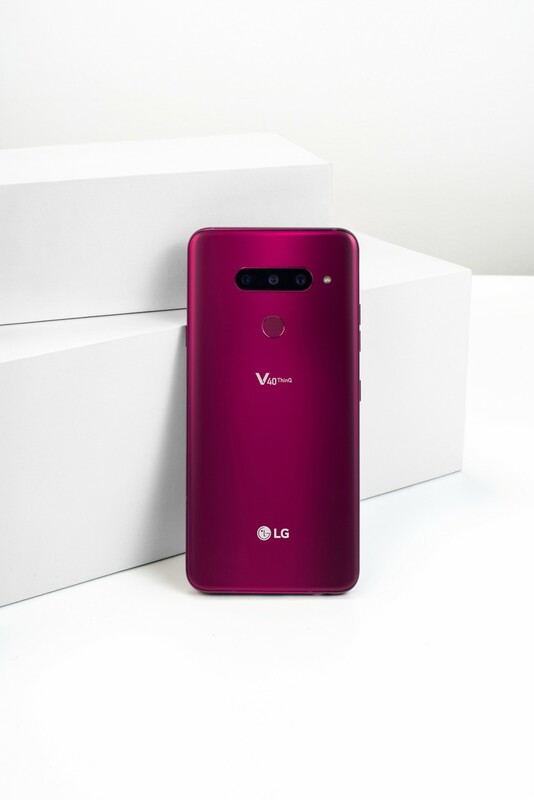 NEW YORK – LG, today, unveiled its first five-camera smartphone – the V40 ThinQ™ – and you can preorder yours from Verizon starting October 11. This multimedia powerhouse features simultaneous photo capture from multiple cameras, immersive 3D surround sound and a massive 6.4” display, so you can express yourself artistically and entertain yourself in ways never before possible. Verizon unlimited is the perfect complement to the V40 ThinQ, giving you the ability to stream, upload and share all those photos and videos with your friends, family and followers. Verizon is offering two great deals worth up to $500 to help get your hands on a new V40. For a limited time, new and existing customers can get $200 off a V40 when purchased on Verizon device payment. Additionally, if you’re switching to Verizon or adding a new line, you can get up to $300 off when you trade in your old phone*. Finally, If you preorder a V40 ThinQ from Verizon between October 11 and October 17 you can received a free SanDisk Ultra® 256GB microSDXC™ memory card and adapter, a DJI™ OSMO™ Mobile 2 Gimbal and auto enrollment in the LG Second Year Promise program**. Five cameras are better than one. Have you ever taken a photo of your child and wished you had more room to include friends and family? Have you taken a photo at a ball game and been frustrated that your smartphone couldn’t zoom in tight enough to clearly capture a pitch? With the V40 ThinQ photo, regret is a thing of the past. The three rear cameras let you take photos at three different focal ranges simultaneously, so you never miss an angle and can choose the best photo to share or print. The telephoto zoom lens gives you twice the reach of the standard lens without sacrificing image quality. The super wide-angle camera makes it easy to take expansive panoramas and group shots so no one ever feels left out. To make sure your photos are as good as the pros, LG introduces new AI technology that adjusts your subject’s position and frames your picture to help you create an artistically balanced photo. It even adjusts the exposure and shutter speed to enhance your shot. On the flip side, two front-facing cameras capture standard and wide-angle photos so you can grab a quick selfie of yourself or of you and all your friends. With the V40 ThinQ, you can document every moment big or small and you can make your selfies stand out with custom background effects, adjustable lighting and artistic filters. Great cameras deserve a great display and LG’s V-series has long been known for its advances in display technology, particularly in terms of size and quality. The V40 ThinQ is no exception, boasting a 6.4” bright display that fills the front of the phone from edge to edge. The display is powered by LG’s OLED FullVision™ technology for true infinite contrast from self-lighting pixels and perfect blacks that give you ultimate cinematic quality in a smartphone. It’s one thing to be immersed into an audio video experience when you are in a theater, but it’s a lot more challenging when you are surrounded by people and distractions. The LG V40 ThinQ makes it easy to escape from reality with a DTS:X 3D surround sound system*** that gives you spatial sound on the go. Whether you’re listening to your favorite band or watching a movie, when you put on your wired headphones, the audio on the V40 ThinQ feels like it’s coming from all directions. Your LG V40 ThinQ needs an unlimited network that can keep up with all that content you’re creating and easily let you watch the shows and listen to the tunes you love. Above Unlimited includes 75 GB of premium 4G LTE data along with HD video streaming, 20 GB of 4G LTE mobile hotspot, five TravelPass sessions per month (for use in 130 countries) and 500 GB of Verizon Cloud storage, all for $60/line per month for four lines when you enroll in Auto Pay. And if you don’t need all of that, you can still mix and match three great unlimited plans on your account to meet each of your family members’ needs: Go Unlimited, Beyond Unlimited and Above Unlimited. Get your LG V40 ThinQ on Verizon. LG V40 ThinQ will be available for preorder on Verizon starting October 11 in Aurora Black and Verizon-exclusive Moroccan Blue, starting at $40.83 a month for 24 months on Verizon device payment ($979.99 retail; 0% APR). You can also pick up your V40 ThinQ from your local Verizon store, online and through the My Verizon app when it’s available on October 18. Visit verizonwireless.com on October 11 to preorder your V40 ThinQ or for more information. *Up to $979.99 device payment purchase req'd. Less $100 trade-in/promo credit (upgrade) or $300 trade-in/promo credit (new) applied to account over 24 mos w/in 1-2 bill cycles; promo credit ends when balance paid or line terminated/transferred; 0% APR. Trade-in must be in good working and cosmetic condition. **Visit lgv40preorderpromo.com after October 11 to redeem or for more information. Available while supplies last. Please allow up to 6-8 weeks from successful claim validation for item(s) to ship. Subscribers over at AT&T will be able to snag the V40 for $950 or $31.67 a month over 30 months — either way, it works out to the same price. Like other carriers, pre-orders open on October 12th, with general availability, set for October 19th. Starting Oct. 12, AT&T* customers can go to att.com/v40 or visit an AT&T store to pre-order the LG V40 ThinQ on AT&T Next for $31.67 a month for 30 months with eligible service. The new smartphone will be available in our stores starting Oct. 19. And, according to America’s biggest test, only AT&T customers can use the LG V40 ThinQ on the best network, providing the speed, security and reliability you deserve. Stay connected to your world with unlimited data and flexible entertainment options. Go to att.com/v40 for more on the LG V40 ThinQ from AT&T. The House of Legere opens pre-orders for LG's latest on October 12th, like most other carriers. Pricing is $200 down and $30 a month for 24 months, or $920 if you'd prefer to pay for it all upfront. Retail availability for those looking to grab one in-store is October 19th — again, like most other US carriers. The V40 will support Team Magenta's 600MHz bands, as well, giving you priority access to that mostly uncontested set of frequencies. Bellevue, Washington – October 3, 2018 – It’s official – the new LG V40 ThinQTM is headed to T-Mobile. 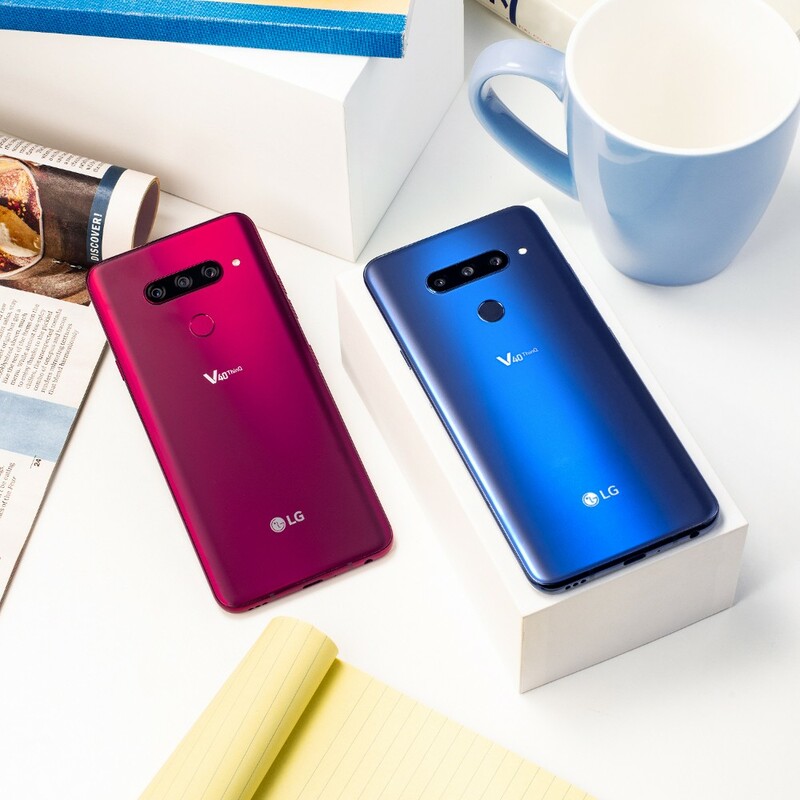 The LG V40 ThinQ is the 18th 600 MHz capable device to launch at the Un-carrier, and this gigabit-class superphone lights up every single speed-boosting advanced LTE technology on the T-Mobile network, including 4x4 MIMO, carrier aggregation, 256 QAM and License Assisted Access (LAA). Today T-Mobile was crowned the fastest LTE network for the 19th quarter in a row making the Un-carrier the only place to unleash the power of the new LG V40 ThinQ. The LG V40 ThinQ rocks five separate cameras and advanced AI photo capabilities so you can capture key life moments from every angle…with just one click. And if you want to really dazzle, use the superphone’s Cine Shot function to add animation to photos and bring them to life. The LG V40 ThinQ also features a 6.4” OLED display in a sleek, modern design with Boom Box Speakers and DTS-X 3D surround sound*, so you can pump up the volume and get a quality sound experience. The LG V40 ThinQ is available for online pre-sale starting Friday, Oct. 12 and in T-Mobile retail stores Friday, Oct. 19 for $200 down and $30 a month for 24 months (FRP: $920) on the T-Mobile Equipment Installment Plan. For more information on the entire smartphone portfolio at the Un-carrier, head here and check out the deals hub for awesome limited-time offers. Sprint customers can snag the V40 in pre-order on October 19th, with a bit of a discount via Sprint's Flex Lease: $20 per month over 18 months. That works out to a $360 savings, according to Sprint. It's a limited time offer, though, so jump on it if you're interested. We're told outright pricing is $960. Never before have photo and video buffs had so many tools at their fingertips on a wireless device! Sprint (NYSE:S) today announced the upcoming availability of LG V40 ThinQTM boasting three rear cameras (standard/2x zoom telephoto/super wide) and 2 front cameras (standard/wide) so you can capture more of life’s moments. Working together, the five cameras capture moments big or small, at different angles and from every perspective. LG V40 ThinQ will be available on Oct. 19 for just $20 per month with Sprint Flex Lease – that’s a savings of $360 over the 18-month lease.1 This limited-time promotion will be in all Sprint retail channels, including www.sprint.com and 1-800-Sprint1. Sprint customers can choose from a selection of tailor-made Unlimited plans to meet different needs and lifestyles – all at the best price. "Without a doubt, LG V40 ThinQ meets our customers’ demands for access to the most advanced wireless technology available today," said Dow Draper, Sprint chief commercial officer. "It couples well with Sprint’s robust Unlimited plans so customers can take great photos and videos and share them without worrying about data consumption. 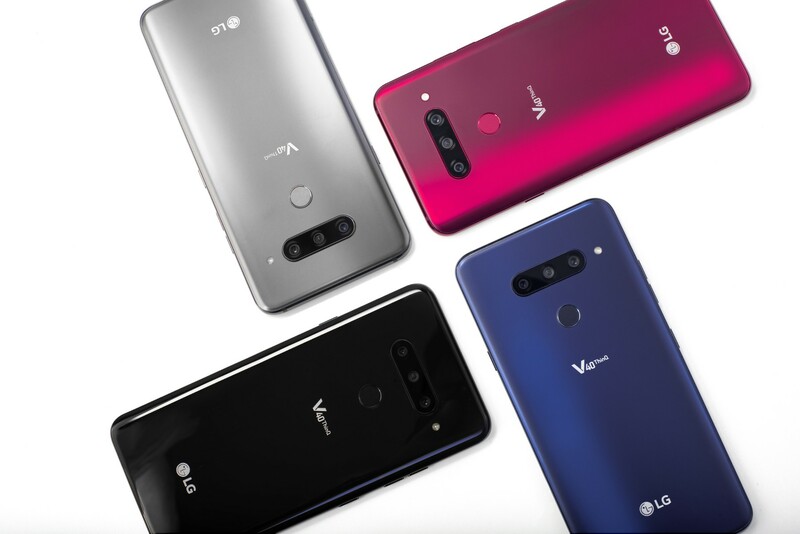 I am excited to see what our customers create with the amazing technology in LG V40 ThinQ." Triple Shot: Whether you want to zoom in and get close, capture the bigger picture or get an everyday shot, capture it all with 3 rear cameras. Easily capture 3 photos - standard, 2x zoom, super wide angle- with just one click. With Triple Preview, get a live preview of all three rear cameras to compare and select the best lens for your scene. Dual Front Cameras: Select from the dual front— standard and wide— lens cameras to capture standout selfies that are clear and rich with detail. The dual front cameras also work together to enhance portrait selfies with artistic background and lighting effects. Super Wide-Angle Camera: Capture the full story with the super wide-angle lens with 107 degrees field of view to create photos without compromise. Turn expansive panoramas and group shots into memorable moments. AI Camera: The intuitive AI Camera helps you take better pictures by recognizing what you’re shooting. AI Composition adjusts the position of your subject for artistically balanced photos while AI CAM recommends photo-enhancing filters for your specific scene. In addition, LG V40 ThinQ puts LG’s award-winning OLED TV technology in the palm of your hand. The brilliant 6.4" edge-to-edge screen is nestled in a sleek, impressively light design for the ultimate comfort. DTS:X 3D Surround Sound gives you an immersive sound experience, that comes from all directions, while the Boombox Speaker provides room-filling, premium audio with bass you can feel. LG V40 ThinQ leverages the latest Gigabit-class LTE capabilities Sprint is rolling out as part of its massive Next-Gen Network investment to improve coverage, reliability and speed nationwide. There’s never been a better time to try Sprint’s Network Built for Unlimited. In fact, Sprint has the most improved network according to Ookla as shown in Speedtest Intelligence data2 and PCMag’s 2018 Fastest Mobile Networks report. In both, the company’s year-over-year increase in national average download speeds outpaced the competitors3, including an 87 percent lift as reported in PCMag’s annual tests. Sprint customers can protect their LG V40 ThinQ with Sprint Complete, an affordable suite of benefits providing protection against life’s "oops moments" and on-demand tech support. Sprint Complete is the most comprehensive protection program in the wireless industry and it is now available for select Sprint phones, tablets and smartwatches. Sprint offers the most repair options including in store repair, on-site repair, and mail-in repair (select models only) and is also the only major carrier to use manufacturer-certified parts in all repairs. Sign-up is available within 30 days of a phone activation or upgrade. For more details including the full list of program benefits, please visit www.sprint.com/protection. Sprint (NYSE: S) is a communications services company that creates more and better ways to connect its customers to the things they care about most. Sprint served 54.6 million connections as of June 30, 2018, and is widely recognized for developing, engineering and deploying innovative technologies, including the first wireless 4G service from a national carrier in the United States; leading no-contract brands including Virgin Mobile USA, Boost Mobile, and Assurance Wireless; instant national and international push-to-talk capabilities; and a global Tier 1 Internet backbone. Today, Sprint’s legacy of innovation and service continues with an increased investment to dramatically improve coverage, reliability and speed across its nationwide network and commitment to launching the first 5G mobile network in the U.S. You can learn more and visit Sprint at www.sprint.com or www.facebook.com/sprint and www.twitter.com/sprint. 1 $20/mo. after $20/mo. credit, applied within two bills. With approved credit, 18-month lease with upgrade or new line of service are eligible. If you cancel early the remaining balance is due. Subject to $30 activation fee. Monthly lease payment excludes taxes. Requires credit approval & qualifying plan. 2See http://speedtest.net/reports/united-states/ for more information. 3 Based on analysis by Ookla® of Speedtest Intelligence® data for average download speeds from June 2017 to June 2018 for all mobile results. Ookla trademarks used under license and reprinted with permission. Preorders at US Cellular open on the same October 12th date, though pricing is a bit more complicated. Outright, we're told it will cost $900, or $29.99 on a 30-month "equipment installment plan," but pre-orders will also get $150 back in bill credits, as well as a nearly-free case for a strangely triple-decimal $.011 price. Whatever that works out to, we're also told it'll cost $900 outright, with availability set for October 19th. CHICAGO (Oct. 3, 2018) – U.S. Cellular will open up preorders for the LG V40 ThinQ, the latest V Series smartphone from LG, in stores and online at www.uscellular.com on Oct. 12. 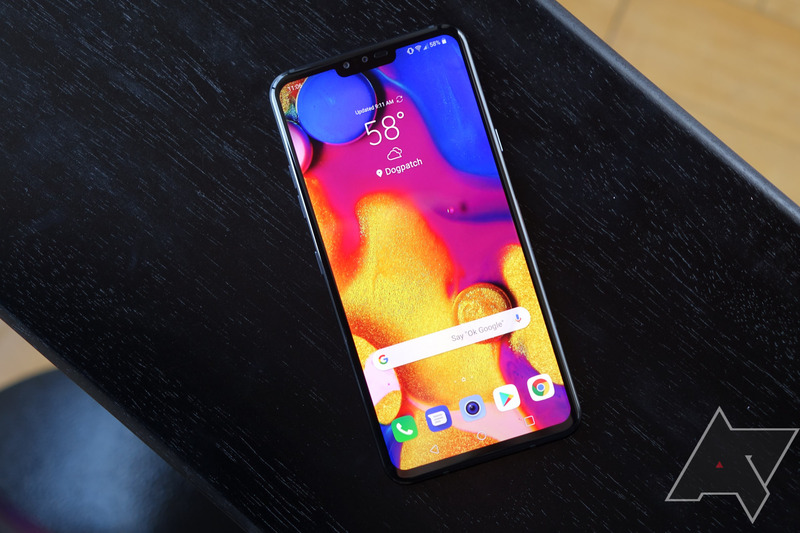 Customers who purchase the LG V40 ThinQ at U.S. Cellular can take advantage of the company’s exclusive Unlimited with Payback plans that pay customers back for data they don’t use. Customers will get paid back $10 per month when they use less than 3GB of data per line, so a family of four can save up to $40 per month. Anyone who preorders the LG V40 ThinQ on a new line of service at U.S. Cellular can receive $150 back in bill credits and a V40 ThinQ case for just $.011. In addition, if they pre-order between Oct. 12 and Oct. 18, they are eligible to receive a free SanDisk Ultra® 256GB microSDXC™ UHS-1 Card & Adapter and one DJI™ OSMO™ Mobile 2 Gimbal, an estimated total value of $330, courtesy of LG. For more information, see www.LGV40preorderpromo.com. The LG V40 ThinQ is a five-camera smartphone. Users can capture more of life's moments, even the unexpected memories, as they happen with the three rear and two front facing cameras. Featuring LG’s largest, most immersive mobile OLED display in an impressively light and sleek design, the LG V40 ThinQ is equipped with new AI functionality and room-filling audio experience. Now in one phone, you have all the tools to capture, create and artistically express yourself. U.S. Cellular will offer the LG V40 ThinQ for $29.99 on a 30 month equipment installment plan, and it will be available for purchase on Oct. 19. 1Offer requires new qualifying smartphone purchase on a 30-mo. RIC with $0 Down and 0% APR and Device Protection+. Discount comes via a monthly bill credit. Credit approval required. U.S. Cellular is the fifth-largest full-service wireless carrier in the United States, providing national network coverage and industry-leading innovations designed to elevate the customer experience. The Chicago-based carrier offers coverage where the other carriers don't and a wide range of communication services that enhance consumers’ lives, increase the competitiveness of local businesses and improve the efficiency of government operations. For the fifth time in a row, U.S. Cellular has the Highest Wireless Network Quality Performance, according to J.D. Power’s twice-annual U.S. Wireless Network Quality Performance Study, and 99 percent of customers have access to 4G LTE speeds. To learn more about U.S. Cellular, visit one of its retail stores or www.uscellular.com. To get the latest news, promos and videos, connect with U.S. Cellular on Facebook.com/uscellular, Twitter.com/uscellular and YouTube.com/uscellularcorp. Launch dates, pricing and additional details for both the LG V40 ThinQ and LG Watch W7 will be announced locally at the time of availability. 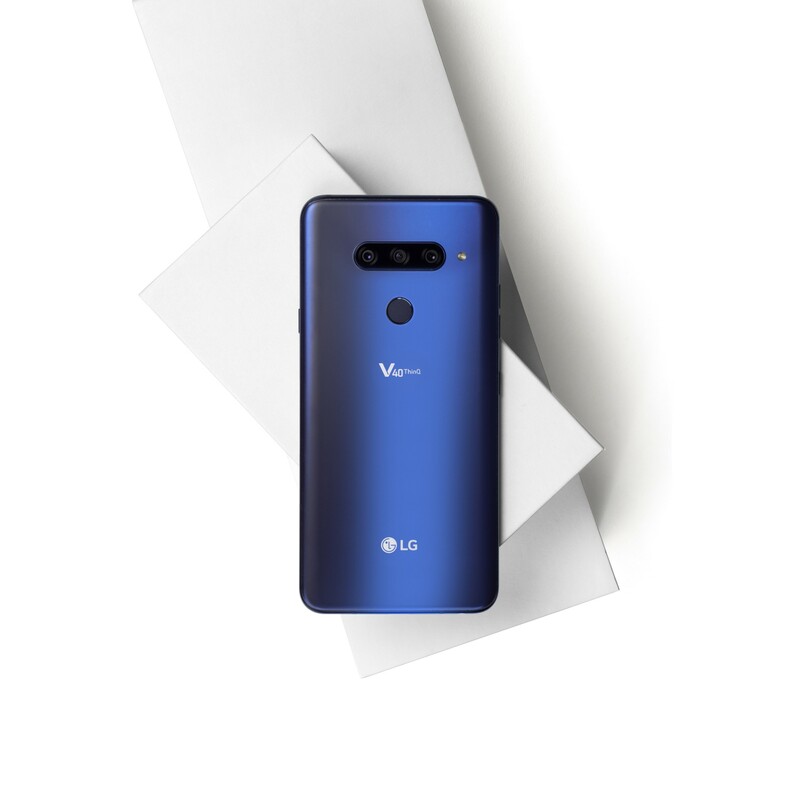 Just a little over a week from the V40's debut, your chance has finally arrived to get a pre-order in for LG's latest flagship. As we noted when initially sharing these pre-order dates with you, Verizon couldn't control its enthusiasm and got things started a day early, accepting pre-orders beginning yesterday. Today the rest of the major carriers join Verizon, with the start of V40 pre-orders of their own.